There are two entirely different and conflicting schools of thought when it comes to the pros and cons of skipping meals in order to achieve weight loss. Some experts are strongly opposed to skipping any meals, instead recommending that people eat frequent, small meals — at least every two to three hours throughout the day. 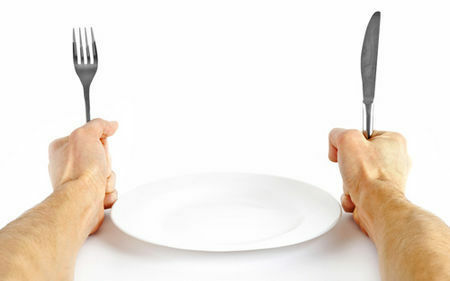 Others recommend occasionally skipping meals, known as intermittent fasting, as a form of weight loss. These experts claim that skipping meals not only serves as a method of cutting calories, but also offers additional advantages. What’s the truth? The scientists opposed to skipping meals for weight loss admit that skipping meals can result in a significant immediate weight loss. Unfortunately, this weight loss consists largely of water and muscle mass. This weight, and possibly more, will quickly be gained back. These experts say that skipping meals and going longer than a few hours without eating can cause the body to go into “starvation mode,” slowing the metabolism and conserving energy by discouraging the burning of calories and promoting the storage of fat. This can also diminish a person’s muscle mass and eventually result in weight gains instead of loss. In addition, they also point out that skipping meals causes cravings, and very often, a person will compensate for the lost calories by overeating at the next meal, and actually consuming even more calories than usual. Finally, skipping meals can lead to hypoglycemia, or low blood sugar, causing dizziness and fatigue, hindering a person’s performance and discouraging physical activity. As a result, exercise may become less intense or even fall by the wayside completely. Obviously, this will also contribute to an eventual loss of muscle mass. Because lean muscle mass burns calories more efficiently than fat, this loss of muscle mass leads to further slowing of the metabolism, and therefore, more potential for weight gain. However, some experts weigh in on the side of skipping meals for weight loss. These scientists believe that skipping meals can rest and reset the metabolism, helping it perform more efficiently. They say this “rest and reset” applies to the rest of the body, too, and in fact, they claim that intermittent fasting, or skipping meals, may even increase a person’s lifespan. Because the body perceives a food shortage as a reason to produce less energy, it turns on a chemical pathway that actually slows down the body’s aging process. In addition, some people find meal skipping an easier way to adhere to a diet than an overall reduction of calories, and long-term adherence leads to long-term weight loss and maintenance. As with anything else, people may respond differently to skipping meals depending on their genetic makeup and the makeup of their diet aside from meal skipping. They key ingredient for weight loss appears to be general calorie restriction; but it also depends on the quality of those calories. If a diet that is consistently healthy overall is followed, skipping meals, or intermittent fasting, may result in weight loss. If skipping meals causes a person to suffer from the cravings and a loss of willpower that culminates in overeating, or from fatigue that results in missed workouts and decreased activity, skipping meals will likely have the opposite effect. As with anything, it is best to consult a qualified health professional to determine what would be best for you and your weight loss goals.